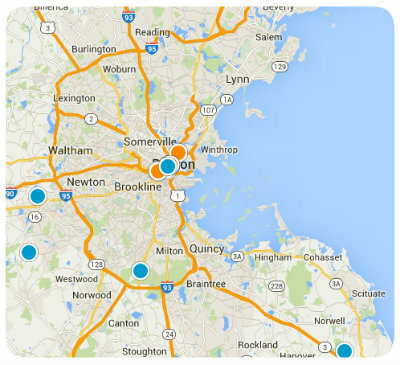 Quincy, Massachusetts is a city of suburban neighborhoods with diverse real estate options. Prospective homebuyers are certain to find whatever they might be looking for in one of Quincy’s many charming neighborhoods. The Montclair neighborhood in North Quincy was once part of Dorchester but became part of Quincy in 1792. Monclair is bordered by the Neponset River on the north, North Central and Sherman Streets on the south, Newport Avenue on the east and Milton on the west. Montclair, like the rest of Quincy, has a long rich history preserved and highlighted in its many landmarks and points of interest. Landmarks in Montclair include Montclair Park, Bishop Field, Montclair Elementary School and the President’s Golf Course. Quincy is known as the City of Presidents and is home to U.S. Presidents John Adams and John Quincy Adams. Not only is it a city with rich history, it is also a city with tremendous natural beauty. Home to the Blue Hills Reservation, acres of gorgeous parks and 27 miles of coastline and beautiful beaches, Quincy is a popular choice among prospective homebuyers. Homes for sale in Quincy, and specifically in Montclair, include single family residences of varying architectural styles, property sizes and price. Buy a home in Montclair and enjoy the convenience of living next to the North Quincy MBTA Red Line station. Students in Montclair are served by Quincy Public Schools, a district comprised of 2 high schools, 5 middle schools and 11 elementary schools. This family friendly community is a great place to call home and has numerous other amenities, not mentioned here, that are worthy of your consideration. If you have any questions regarding homes for sale in Montclair in Quincy, Massachusetts, or you would like more information regarding other real estate options in the Boston metro area, please do not hesitate to contact us today.